A full week with nothing in the diary so why not take the caravan down to Kent for a few days. My first choice was Black Horse Farm at Folkestone but it was fully booked for some of the nights I wanted so instead I looked at Daleacres on Romney Marsh. They had pitches available so I booked. I was quite looking forward to seeing the place again. The last time we went there as a family, taking our Siamese cat with us was in 1970. I have memories of our cat taking himself off for a prowl along the hedgerows and proudly returning with a freshly caught vole. For my first drive out from the site I drove twenty miles along the coast to visit Samphire Hoe Nature Reserve, just outside Dover. 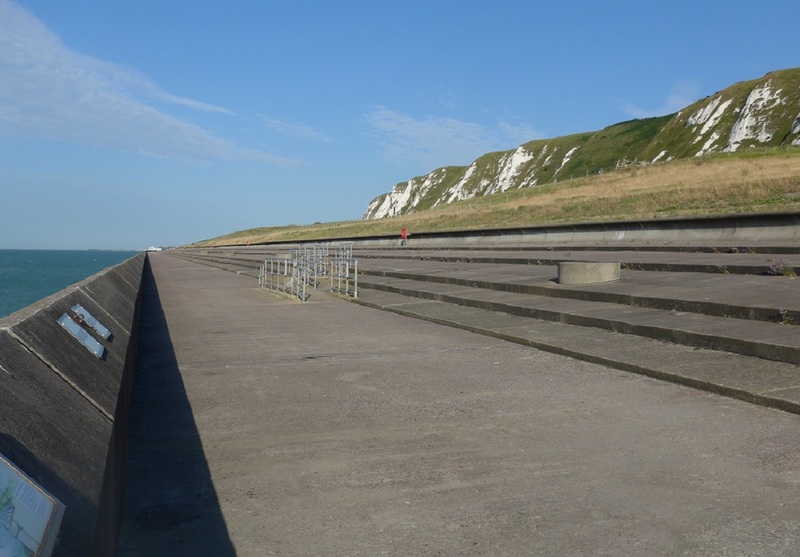 The entrance is from the dual carriageway – the side which leaves Dover and heads towards Folkestone. Entry is down a one-way, traffic-light controlled tunnel cut through the cliff. The road comes out onto what used to be the narrow beach at the foot of the cliffs. If you are into DIY you’ve probably at some time been faced with getting rid of unwanted soil. If it’s just a bucket full, you may have sneaked it into the dustbin or if it was a bit more, taken it to the rubbish tip. The last little bit of block paving I laid to extend my drive, produced two cubic meters of earth – enough to fill a small skip. But what if you’ve got FIVE MILLION cubic metres of the stuff to get rid of. What do you do with that? ……… You build a nature reserve. Back in the early 1980’s when the Channel Tunnel was being planned, there were lots of suggestions as to how the spoil from the tunnel boring could be got rid of. The winning solution was to create Samphire Hoe. They began by sinking two rows of sheet piles out into the sea from the base of the cliff. After they’d gone straight out to sea for a ¼ of a mile, they made a 90 degree turn and continued putting in the piles parallel with the cliff for a mile. The piling then made a 45 degree turn towards the cliff, finally enclosing the area at the base of the cliff. The three metre wide space between the piles was then filled with mass concrete. In all, the area covered around 75 acres. Once it was pumped dry, it was into this space that the builders of the tunnel dumped the chalk. After a walk through the reserve, I drove to the White Cliffs National Trust car park. Walking along the top of the cliffs you get a bird’s eye view of the activity in the Port of Dover. On the way back to Daleacres I visited the RAF Battle of Britain Memorial which is built on what used to be a World War-2 airfield situated on the high ground to the west of Dover. The memorial is laid out in the form of a giant propeller with a sculpture of a young airman dressed ready and waiting for the the next order for take off. A semi-circle of panels bearing the names of all the young people who gave their lives during that short period forms a backdrop. To one side of the complex are two WW2 aircraft. A Spitfire and a Hurricane. On my second day I drove towards Canterbury to visit Howletts Wild Animal Park. I left early, wanting to get most of my visit done before it became too hot. I arrived just as it was opening at 9.30. The Park began as a private zoo in 1957 on a large country estate owned by the gambler, John Aspinall. During the 1950s gambling was illegal except for when it took place on race courses – and on postal football pools. Aspinall bent the law by hosting private gaming parties for members of the aristocracy where fabulous amounts of money were lost during the course of an evening. Aspinall’s hobby was keeping exotic pets. Amongst his collection he kept baby lion cubs and monkeys. In 1974 he became involved in the disappearance of one of his gambling friends, Lord Lucan. Lucan was facing charges of murder for killing his children’s nanny, mistaking her in the dark for his wife. Before he could be brought before the court, he disappeared, and so escaped justice. It was believed but not proved that Aspinall had helped in his disappearance. The zoo is now run by the Aspinal Foundation on the Howletts country estate with the mansion being at the centre. The animal enclosures are laid out on either side of a circular route around the estate. To visit every enclosure involves a great amount of walking, however I was only able to manage a comparatively short distance before retracing my steps back to the entrance. Some form of transport would definitely be an asset. Saturday the 14th of October 1066……. …That was the day Harold, fresh from his victory at the Battle of Stamford Bridge, met his adversary, Duke William of Normandy. The two armies were evenly matched however, the forced march from Yorkshire, left Harold at a disadvantage. A close-combat battle had continued for most of the day, but by nightfall, Harold was dead and the English army was in disarray. William lost no time in building castles, giving grants of land to his knights, and savagely dealing with any resistance. By Christmas, he had himself crowned King of England in Westminster Abbey. History has it that the Pope ordered William to do penance for killing so many people during his conquest of England so in response, he ordered the building of an Abbey on the site of his first battle on English soil. So on Wednesday my first stop on my tour was to visit the site of the battle and see the remains of the once great Abbey. Building began in 1070 but the great church was not finished until 1094, by which time William was dead. The church was designed so that it’s high altar was positioned on the spot where Harold supposedly met his death. The Abbey continued to flourish right up to 1538 when Henry the Eighth ordered the Dissolution of the Monasteries. Henry took the treasure but the Abbey and much of its lands was given to his friend and Master of the Horse, Sir Anthony Browne, who demolished the church and parts of the cloisters and turned the abbot’s quarters into a country house. Later in the day I stopped off in Rye, one of the Cinque Ports. In medieval times the town was a flourishing sea port but because of the silting up of the river, it now stands several miles from the sea. I wanted to walk up Mermaid Street where the ancient Mermaid Inn is situated. The building declares that it was built in 1420. I also came here for the first time in 1958 when the river frontage had been converted to look like the French town for the film “Dunkirk” with John Mills, Richard Attenborough and Bernard Lee was being made. From Rye I made my way across to Dungeness, a desolate shingle promontory said to be one of the largest expanses of shingle in Europe. It continues to build up year on year so that in all, the area has had seven different lighthouses. The two modern power stations dominate the landscape but I headed off to the train station where the train had just ended its journey across the marsh. The miniature train is built in a 1/3rd size from normal. It was the brain child of two model engineers who first started with one train running on a much shorter length of track. Now a service runs from Hythe to Dungeness. I ended my day with a look at the beach at Littlestones. Very little has changed from when we used to come here on caravanning weekends in the 1970’s. Close by is one of the Martello Towers. These were built during the period when Napoleon was threatening invasion. Originally, all along the coastline from the Wash round to Hastings, 103 towers were built. The design (and name) was said to be copied from a circular fort on Mortella Point in Corsica. My first stop today was less than a mile from Daleacres. I wanted to take a stroll along the Royal Military Canal. Following the French Revolution, Napoleon Bonaparte had a vision of a united Europe under French rule. His eyes turned towards England as his first target. He supposedly said, “All my thoughts are directed towards England. I want only for a favourable wind to plant the Imperial Eagle on the Tower of London.” The British government were alarmed and were particularly worried about the flat Romney Marsh as a landing for invasion. Plans were quickly drawn up to build a circular canal running from Hythe in the east to Rye in the west – a distance of 19 miles. It would be 20yards wide and 3.5 yards deep and all dug by hand with shovel and wheel barrow. However before it was completed Nelson and the Battle of Trafalgar gave Napoleon other things to think about. Now the Canal remains a lovely place to walk and to see some beautiful scenery and wild-life. Later in the morning I drove into Dover and went to visit the Castle. I was here two years ago but only saw a small part of what’s there. After a quick look again at the Keep and the Roman Lighthouse, I headed for the Secret Wartime Tunnels. The first tunnels under Dover Castle were dug in the Middle Ages. Then again more were dug during the Napoleonic Wars as a barracks to accommodate up to 2000 troops. In May 1940, as France was over-run by the German advance, the tunnels became the nerve centre for ‘Operation Dynamo’ which was the code name for the evacuation of the British Army from Dunkirk’s beaches. Admiral Ramsay was in charge of operations and his efforts are commemorated in a statue of him standing on the cliff tops.. In the Second World War there was also a hospital in the tunnels complete with operating theatre. The main military telephone exchange was installed in the tunnels in 1941. It linked Dover to the Admiralty, the War Office and the Air ministry and to fighter airfields. As one stands on the deck of a P&O ferry approaching Dover harbour, it’s hard to imagine all the huge rooms and tunnels, plus all the activity that went on inside the cliffs and under the Castle. Next day we had rain. The first wet day for weeks – but it was also the day for my return home.